WR – Mathew Slater – (NE) – Yup a WR. Slater is not worth grabbing and will probably not be able to score you any fantasy points, due to his WR position in pretty much all leagues. 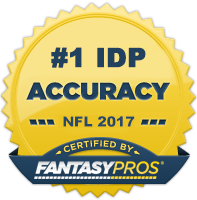 Slater did have a solid game, as an IDP, this past week against the Colts. His 7 tackles lead the Patriots plus he had a forced fumble. Like I said, don’t add him, unless he has a few more games like this and you can get those points in your league.